I love this simple, quick and easy Garlic Butter Sauteed Shrimp recipe. 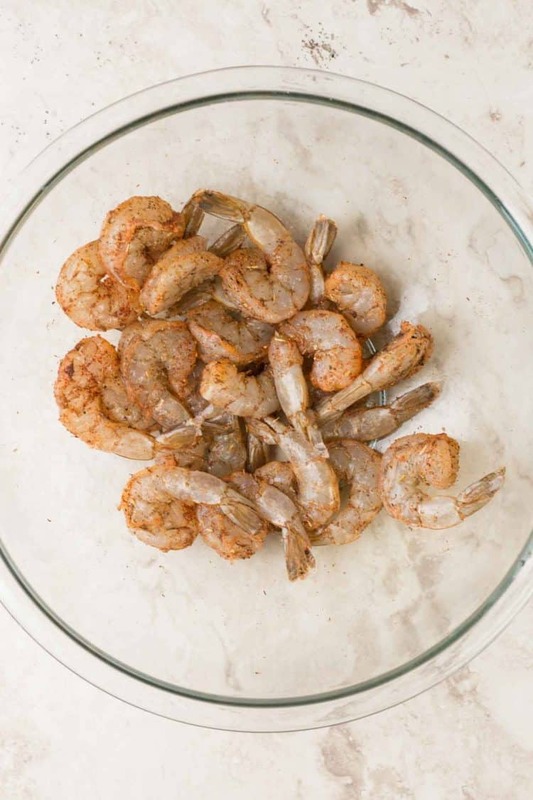 This pan-fried shrimp is tossed with an easy Italian seasoning sautéed in butter and lemon. Though we often enjoy breaded shrimp such as our Bang Bang Shrimp Recipe, this pan sauteed shrimp is completely ready in 10 minutes, perfect for quick dinners! The recipe was inspired by our most popular fish recipe on our blog, the Buttered Cod. Okay, so this recipe doesn’t get any easier! 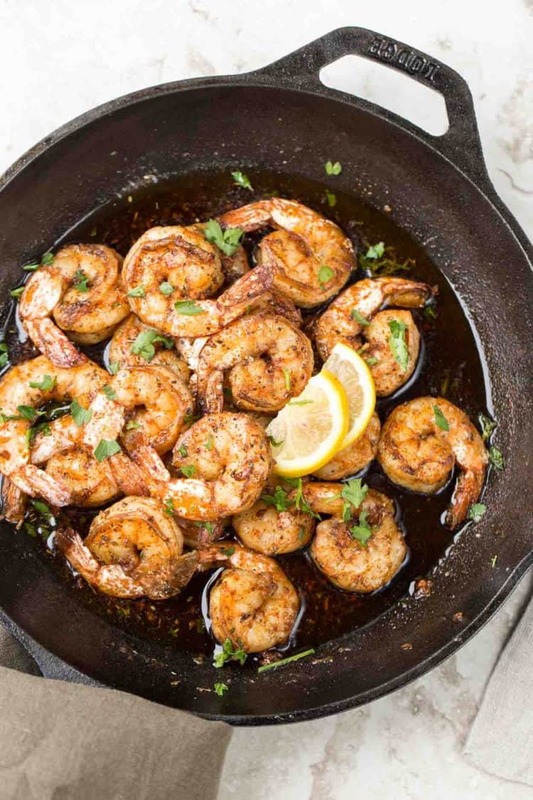 Pan sauteed shrimp seasoned with minimal seasonings sauteed in garlic butter and lemon. The perfect balance of flavors that are great to serve for a simple dinner, an appetizer or as a side dish. 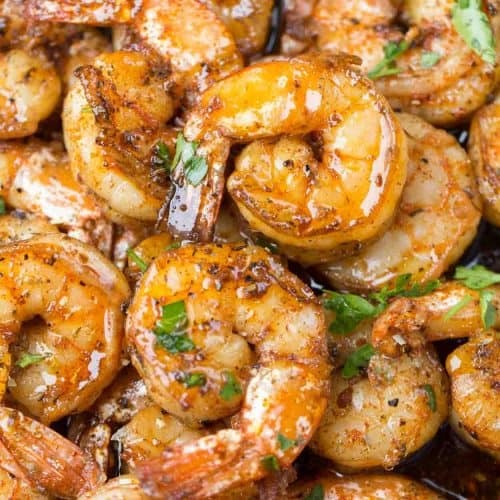 Shrimp is a great addition to any meal, it goes wonderful with any other protein. Our Baked Shrimp Salmon and Asparagus is similar to this recipe as it gets its juiciness from the butter and lemon and quick seasoning. Italian seasoning– a blend of herbs used to flavor many Italian dishes. Salt and pepper– classic seasoning for any dish. Paprika– paprika is just dried pepper that been ground. It adds a hint of smoky mild sweetness. Buffalo Shrimp Dip Recipe- Classic buffalo dip but with shrimp. Creamy Chicken Shrimp Scampi- In the most amazing sauce. Shrimp Eggplant in Creamy Sauce- The fried eggplant is irresistible. 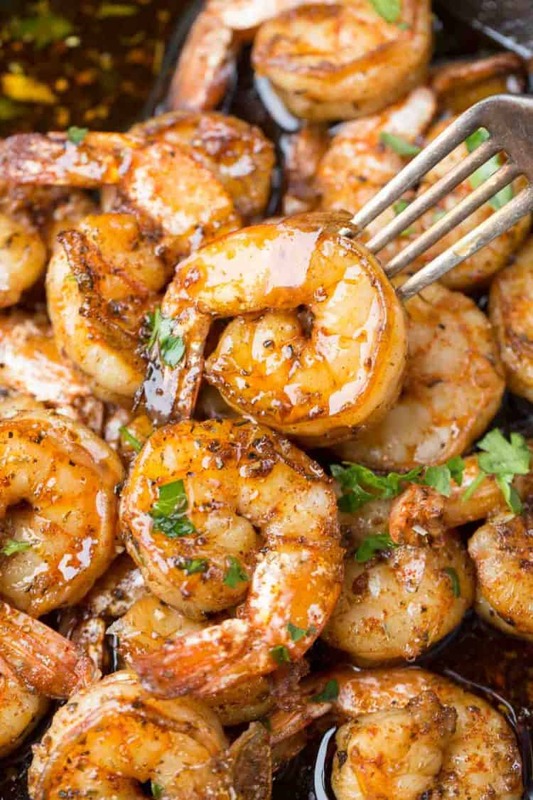 This garlic shrimp with butter and seasonings is so easy to make. Once you try it, the recipe will become a regular on the menu. Devein and remove the tail of shrimp (I kept my tail on b/c they look better in pictures). In a bowl, combine the ingredients for the seasonings. Whisk together the Italian seasoning, salt, pepper, and paprika. In a skillet, add the butter and garlic, saute until the garlic is fragrant (30 seconds – 1 minute), stirring frequently. Add seasoned shrimp and cook 2-3 minutes per side over medium heat. Remove from heat and drizzle freshly squeezed lemon over the entire dish. Serve the buttery garlic shrimp with a side of pasta, or mashed potatoes. how long does it take to saute shrimp? Don’t OVERCOOK the shrimp, it will taste bland and rubbery. The perfect shrimp is cooked between 4 – 6 minutes total, depending on the size of the shrimp. Shrimp is ready when it is no longer opaque and has a light pink color to it. Shrimp is best if enjoyed immediately. how to reheat garlic butter shrimp? This shrimp recipe reheats wonderfully. Store leftovers in an airtight container in the refrigerator. To reheat, add shrimp to a skillet over low heat until the shrimp is reheated. I hope you love this easy shrimp recipe as much as we do! Even our kiddos enjoy the shrimp smothered in the lemon butter. It’s the perfect easy dinner. The easiest recipe for cooking shrimp. The shrimp is sauteed in garlic butter and lemon sauce and completely ready in 10 minutes. Defrost shrimp and completely pat dry. Devein the shrimp and remove the tail, optional. Combine the ingredients for the seasoning: the Italian seasoning, salt, pepper and paprika. In a bowl, coat the shrimp with the seasoning and mix well. In a skillet, over medium heat, melt the butter and garlic, stirring frequently. Add shrimp and cook 2-3 minutes per side. Remove from heat and drizzle freshly squeezed lemon, mix to combine. So easy and delicious. Made it with minced garlic instead of powdered and a bag of seafood mix. Love how practical and straight forward your recipes are! Great for Mums. 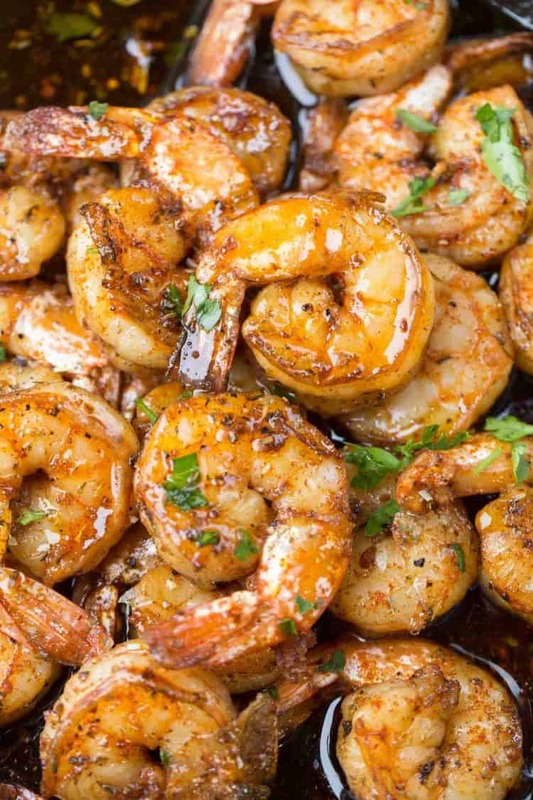 Can you leave the marinated shrimp overnight in the fridge? Though I have not tried it myself, I don’t see why not:). Can you please post a picture with the igredients, i am personally interested in what kind of italian seasoning did you use? I can never find the right one. This looks delish!! Can’t wait to try it! Luba, Think u will enjoy it if u like shrimp:).